First of all, I want to thank all of you for all of the congratulations on my blog, Facebook, Twitter and Instagram. I was feeling the love last week! Troy and I are so excited to be expecting our first baby. I wanted to share some different details with all of you since I always love to read these kinds of posts myself about other people. I am 12 weeks pregnant. My period was about a week late and I had taken a few pregnancy tests and they were all negative. I still had a strange feeling that I may have been pregnant though so I took another one on 1/17 and it came up as a very faint line. I then took a digital test and it confirmed that I was pregnant!!! I was in my bathroom by myself at about 3 AM (couldn’t sleep due to the excitement). Afterwards, I took a shower and walked on the treadmill because I didn’t know what to do with my extra energy and excitement at that point. I had thought about how I would tell Troy that I was pregnant for a long time because I knew that it would be such a special day in our lives. When he came home from work, I gave him a package that I told him was from my blog (you know, as a review blogger, I get a package here and there sometimes ; )). He opened it up and found two pieces of paper inside saying “Big Changes for the 2014-2015 school year” “You are going to be a dad!!”. I wrote that since he is a teacher and the baby would be due in September. He read the first sheet of paper out loud and didn’t really catch on until the second piece of paper. When he read that, he was so, so excited. He picked me up and spun me around the room. He kept saying “this is so great”. I got a video to capture our special moment. Also, Chico is the cutesy name that we call the baby. My dad actually made it up when I first met Troy as a joke. It was so fun to tell our families that we are expecting. 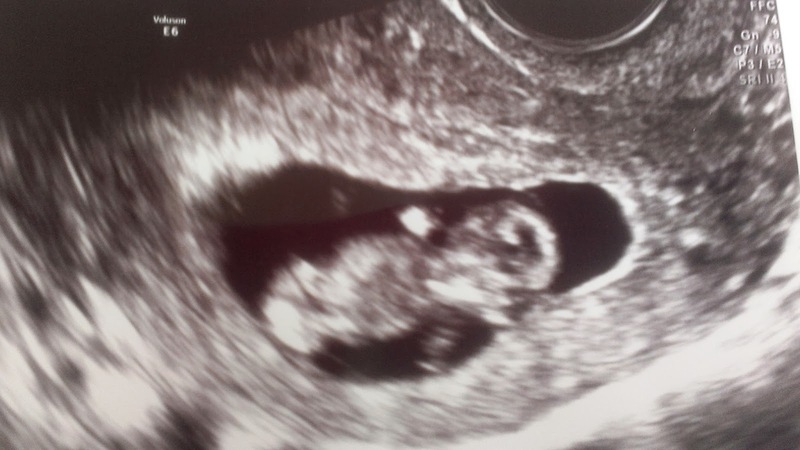 This will be the first grandchild on both sides so it is super exciting. My mom didn’t believe it at first but then went crazy out of excitement. My sister cried for about 20 minutes straight (and I have a great video to prove it). My dad was really excited as he has been talking about it for awhile but he seemed pretty surprised at first. When I told my Busia, she said that she had a feeling that I was pregnant which was crazy. Troy’s Aunts, Dad and Grandma were really fun to tell because we went out to breakfast and told them there. They were super happy for us. Troy’s mom is excited too and we looked at old pictures of Troy as a baby after we told her. The most important person that I actually told first before Troy is our dachshund Jaxen. He woke up with me at 3 in the morning so I told him first. He kept the secret for 12 hours until I was able to tell Troy ; ). Haha. Ava didn’t really care. My mom’s dog Isaac was really excited when we told him (seriously) and he keeps putting his hand on my belly. I don’t know if dogs know someone is pregnant but it sure seems like it. Here I am at 10 weeks 3 days pregnant. A little bump is starting to form! In the evening, my stomach is much bigger. I have been taking weekly photos which I will share soon. That’s it for now. Stay tuned for my first trimester post soon about symptoms, pregnancy nutrition, exercise during pregnancy and more. Great post! I love that you told your dogs! Congratulations to you and Troy. Haha! I know that that makes me totally crazy but I'm okay with that. Thanks so much! congrats! thank you for sharing with us! i love reading your blog! Really excited for you. I love hearing baby news and also love you share it with the fur babies! Aww thanks so much! You are such a loyal reader so for that I thank you! I am 23 weeks pregnant with my first and built very similar to you. It will probably be a while yet before you start showing. Even now depending on what I wear I can hide the bump. I hope the morning sickness is minimal for you! That's awesome! Do you have a blog? By the evening, I look at least 4 months pregnant from eating so much/bloating. Good luck to you with your pregnancy. I love the way you told the good news to your husband! Enjoy this wonderful time, it really goes fast. Best Wishes! Thank you! He was so excited. It is going by really fast so far. Congrats again! I can't wait to read all about your pregnancy journey! Thanks, I love reading how people tell their families as well. Always funafun! Thanks so much Jessica. I feel really good. I have another pregnancy post coming up next week!